Radiocarbon dating is a popular dating method the general public is fairly familiar with. Though they may know it as carbon dating or carbon 14 dating, there is an understood notion that when anything old is found, like an ancient artifact, it can be radiocarbon dated to find out exactly how old it is. Yet, as simple and straightforward as this seems, the process of dating objects via radiocarbon is far from simple and straightforward. Here I will present what radiocarbon is, the dating methods, the assumptions that govern them, and the known discrepancies that plague the method. With a thorough understanding of this dating method, it is my opinion that its ingenious fundamentals can be appreciated, yet greatly overshadowed by its limitations. Every day cosmic rays bombard our atmosphere. These cosmic rays release free neutrons which zip around our nitrogen rich atmosphere at high velocities. The neutrons eventually slow down and bond with the nucleus of the nitrogen changing the atomic weight to that of an unstable carbon atom, Carbon 14 (or C14) (Warf, 212 & Taylor, 6). As the Carbon 14 slowly descends into our lower atmosphere it bonds with oxygen becoming the very unpopular CO2 greenhouse gas (Bowman, 10). Though the vast majority of CO2 is comprised of the more common and stable isotope of carbon, carbon 12 (C12), a small fraction of CO2 (one in 765 million), contains C14. As is common fact, plants photosynthesize and consume CO2, fixing its carbon. Since a small fraction of CO2 contains C14, some of carbon fixed within the plant is that of C14. Animals eat the plants, ingesting the C14 which in turn enters the animal’s tissues (Warf, 212). When an organism dies, it obviously no longer eats, photosynthesizes, etc. There is therefore no way for additional C14 to enter the organism once dead. This leads to an important fact: Only materials once part of the biosphere (organic) can be dated with radiocarbon (Bowman, 12), with the exception of some non-organic materials which can be dated with radiocarbon if their formation involved C14. For example, when lime absorbs CO2 it creates mortar, so the mortar can be dated via radiocarbon since some CO2 molecules are comprised of C14 (Bowman, 13). But in general, non-organic materials usually cannot be dated via radiocarbon. This is a common misunderstanding the general layman has of radiocarbon dating that is important to clarify. What makes C14 significant is that it is an unstable atom. Eventually the extra neutron it picked up in the upper atmosphere will break off releasing a high energy beta particle. This beta release allows the atom to turn back into Nitrogen. This is radioactivity, hence the name radiocarbon. This radioactivity occurs at a measurable rate with a half-life of 5,730 years (Warf, 212). C14 on average emits 15.2 beta particles per minute, or 15.2 disintegrations per minute (dpm), for every gram of carbon (Warf, 213). After one half-life (5,730 years) activity will drop to 7.6 dpm, then 3.8 dpm (Warf, 213). Knowing that C14 degrades into nitrogen at a known rate and organisms do not take in C14 once they’re dead, then it logically follows that the presence of C14 in a dead organism will decrease over time. Therefore, by measuring the amount of C14 in an organism, it can be known how long ago it lived with high C14 remains representing a recent age and lower C14 remains representing an older age. So how is radiocarbon measured and dated? There are in essence, two different forms of carbon dating: the original conventional methods and the more recent AMS (Accelerated Mass Spectrometry). Of the conventional dating methods there are three types; Solid Carbon Counting, Gas Counting, and Liquid Scintillation Counting. AMS on the other hand directly counts atoms. The limit for conventional carbon dating is 10 half-lives (57,300 years) (Warf, 213) or within 40,000 to 60,000 years (Taylor, 3). After that, background radiation and cosmic rays overwhelm the miniscule amount of C14 left. AMS can look back as far as 75,000 years (Warf, 215 & Bowman, 38), though some labs claim it is possible to go as far back as 100,000 years. Conventional carbon dating involves measuring the beta particles that break free as C14 decays (Bowman, 34). These methods were fraught with dating conflicts, many of which will be discussed later. AMS, developed in the 1980s, which overcomes many of the shortfalls of conventional carbon dating, directly measures C14 atoms relative to C12 and C13 atoms (Bowman, 31). This is the main method utilized today. -The atmosphere has had the same amount of C14, (in terms of production, mixing and transfer rates) in the past as it is now. -The biosphere has had the same overall concentration of C14. -C14 concentrations exist in all parts of the biosphere. -The death of a plant or animal, is the point at which it no longer exchanges C14 with the environment. -After ceasing exchange, C14 levels are only modified by radio decay. (Bowman, 14). -The concentration of C14 has been constant over the C14 timescale. -There has been complete and rapid mixing of C14 throughout the various carbon reservoirs on a worldwide basis. -Carbon isotope ratios have not been altered except by that of C14 decay. -The half-life of C14 is accurately known. -C14 can be measured accurately. (Taylor, 3). -Cosmic ray influence on the atmosphere is constant. -C14 concentration in the carbon dioxide cycle is constant. -The decay rate of C14 is constant. -There is no contamination of the dated object. -Carbon dioxide levels in the sea and ocean are constant. -C14 decay formation and decay rates are in equilibrium (Snelling, 856). 1) C14 production in the atmosphere is constant. 2) C14 rapidly mixes and is spread evenly throughout the biosphere. 3) Carbon ratios are only altered by C14 decay after an organism dies. 4) The half-life of C14 is accurately known. 5) C14 can be measured accurately. 6) C14 decay rates and formation rates are in equilibrium. In order for radiocarbon to be effective in dating objects of antiquity, these assumptions must be true. But as you soon shall see, the assumptions are rife with flaws and unquantifiable variables. Many of these problems have been solved in recent years, but many have not. Assumption 1 C14 production in the atmosphere is constant. In order for C14 production in the atmosphere to be constant, cosmic ray influence, which creates C14, must be consistent. However, cosmic ray influence is not constant, but varying. One factor that accounts for this variable is earth’s magnetic field. Our magnetic field is generated by earth’s iron and nickel core (Snelling, 873). Variations in the earth’s magnetic field have altered the production of C14. When the field is highly charged more cosmic rays are deflected. When the charge is low, more cosmic rays enter producing more C14 (Bowman, 18). Studies show the earth’s magnetic field decays at 5% a century and that earth’s magnetic field was 40% stronger in 1,000 AD then it is today (Snelling, 873). The magnetic field is also subject to influence from our sun. Sunspots, which occur on 200 year and 11 year cycles, cause shifts in the earth’s magnetic field and thus alter C14 production. The 11 year cycles can cause as much as 20 years of radiocarbon variation, whereas the 200 year cycles can cause over 100 years’ worth of radiocarbon variation (Bowman, 19). These variations in C14 production in the past can be observed by examining tree ring samples which supposedly go back 8,000 years. In the last 8,000 years cosmic rays have varied as much as 10% (Warf, 213). Beyond this time cosmic rays could have fluctuated more or less, but we have no way of knowing. Yet, there is one aspect of our magnetic field that poses a problem today just as much as it did in the past. The cosmic ray intensity is five times greater at the genetic poles than it is at the equator because our magnetic field is weaker at higher latitudes (Taylor, 7). The turbulent atmosphere mixes inconsistencies quickly enough that this problem is believed to only offset carbon dating by no more than 40 years. But this is still a factor to heavily consider between objects dated near the equator versus near the poles. Bowman writes, “… there are some influences that are both global and pertinent to all samples and thus can neither be avoided nor circumvented by careful choice of content or sample: these are the production effects. They are not insignificant in magnitude, having at some periods in the past accounted for a discrepancy of some 900 years between radiocarbon dates and true calendar years” (Bowman, 43). Human activity has also played a large role in C14 production. Only specimens that lived prior to the advent of nuclear weapons usage can be carbon dated since nuclear blasts created an influx of C14 in our atmosphere (Warf, 213). Fossil fuel consumption also wreaks havoc with the atmospheric ratio between C12 and C14. Because the human-caused burning of large quantities of fossil fuels has altered the atmospheric CO2 concentration, only objects prior to 1950 can be tested accurately (Bowman, 19 & Taylor, 35). Because of this effect, more modern organisms, like wood, appear “dead” with an apparent age much older than they actually are. This is known as the Suess Effect (Taylor, 36). Between 1900 to 1940 C14 levels were steady. After the 1950s, C14 levels shot up over 20% and by the 1970s had increased over 80% (Bowman, 20). As mentioned earlier, tree ring samples, which can be radiocarbon dated, can give us insight into the past as to what the historical atmospheric ratios of C12 to C14 were. This was needed because the first radiocarbon dating methods were yielding very inconsistent dates regarding objects of known age. These discrepancies, many of which will be discussed further later, were chalked up to the variable nature of C14 production and C12/C14 ratio in the atmosphere. Thus a “cheat sheet” was needed to provide a template of past C12/C14 concentrations so that dating methods could be calibrated based off the known variables. In the 1960s an 8,000 year old tree ring sequence was established by Wesley Ferguson, which when compared to the radiocarbon dates, revealed large discrepancies. Calibration curves were established in light of these discrepancies and can go back to 2,500 BC (Bowman, 17). As useful as the calibration curves are, they only go back as far as the tree ring chronology. Using live trees and preserved dead trees (mostly bristlecone pine trees) a master tree-ring chronology has been established going as far back as 8,700 years (Snelling, 895). Tree ring chronology is known as Dendrochronology. And as much of a hero as it seems to be for radiocarbon dating, it isn’t perfect. No items can be accurately dated within the time span of 800 BC to 400 BC because the calibration curve during this time falls flat. In fact, many labs will not date objects believed to have been from this time for that very reason (Bowman, 55). Other issues with dendrochronology lie with the trees themselves. Ring patterns in trees are produced season to season, year to year, and fluctuate depending on temperature and precipitation (Snelling, 895). Trees have been observed to be missing up to 45% of their seasonal rings (Snelling, 895). In other instances trees have been observed to grow multiple growth rings in one season (Snelling, 897). This means that the dendrochronology relies on an additional assumption; that tree rings are a seasonal constant. Since there is no guarantee they are a seasonal constant, we have no way of knowing exactly how far back the tree ring chronology goes. Chronologies can only be established when comparing the same species of trees in the same location. When there are no overlapping areas between older and younger trees, and thus a gap, a floating chronology is established. If missing links of wood are found radiocarbon is used to piece and the fit the wood into the overall chronology (Snelling, 896). This is troubling because it becomes a circular system; tree ring chronology is used to calibrate radiocarbon dating, yet radiocarbon dating is used to date the tree rings. So the assumption that C14 production is constant is incorrect. Though dendrochronology has allowed for calibration adjustments accounting for the production variations, the chronology goes back less than 10,000 years and even so, there is no guarantee that the tree rings are as accurate in chronicling the passing of years as many make them out to be. In one way it can be seen as an assumption to rescue another assumption. What is known is that C14 production has varied in the recent past, so it has surely varied greatly in prehistory as well. Assumption 2 C14 rapidly mixes and is spread evenly throughout the biosphere. According to Bowman, “Equally fundamental is the need for the method to be globally applicable, it should be valid at all, or a good range of, periods in the past. In the case of radiocarbon this in turn requires a global level of C14 in the atmosphere that has not changed with time; in addition, the biosphere should be in equilibrium with the atmosphere” (Bowman, 14). Taylor writes, “One of the most important characteristics of the C14 method is its ability to provide comparable age estimates for organic materials on a worldwide basis. For the ability to be realized, C14 must be mixed quickly (within a few years) and completely throughout all of the carbon-containing reservoirs. If such a condition prevailed, the contemporary C14 content of all organic samples would be essentially identical. Early in the history of C14 dating it was determined that in a number of instances, this was not the case,” (Taylor, 34). As Bowman and Taylor state, the accuracy of radiocarbon dating relies on C14’s equilibrium within the biosphere. Though we have already covered that C14 production has been a historical variable, now we come to the issue of mixing. Atmospheric mixing between the stratosphere and troposphere takes 2 to 4 years (Taylor, 38). However, when C14 production is high, atmospheric mixing is quick. But when production is low, atmospheric mixing slows and C14 is thus not distributed globally quickly. Furthermore, the biosphere does not absorb C12 and C14 equally (Bowman, 18). Organisms have been proven to ingest more C12 than C13, and more C13 than C14. Regardless of the atmospheric ratio of C12 to C14, organisms will consume a higher ratio of C12 atom per every C14 atom than that of the atmosphere (Bowman, 20). Taylor writes, “During certain natural biochemical processes (e.g. photosynthesis) ‘lighter’ isotopes are preferentially incorporated into sample materials. Because of this, variations in C14/C12 rations can occur that have nothing to do with the passage of time,” (Taylor, 35). Another problem is that of ice ages. During the ice age(s) the biosphere contained less plant life. Additionally, colder water temperatures globally would have increased the solubility of carbon. Thus, during cold periods like the ice age, which extends into the time ranges of C14 dating, the C14 exchange globally was not the same as today. Bowman writes, “The effect of these interrelated factors on radiocarbon dates has not yet been established” (Bowman, 19). The last ice age is believed to have peaked 20,000 years ago. This cuts right into the age span that radiocarbon dates for. Thus, the lack of vegetation worldwide during this time constitutes a C12/C14 ratio vastly different than what we observe today, which translates into a lack of confidence for radiocarbon to accurately date during this time span. Marine Effect: The marine effect is an example of a reservoir effect in that the ocean has less C14 concentrations. Though atmospheric and terrestrial biosphere environments can mix C14 quickly, the ocean cannot mix quickly, especially the deeper you go. Ocean mixing is so slow that there are deep areas where radiocarbon dating would reveal radiocarbon ages in excess of a few thousand years. Shallow waters take about 10 years to equalize, but deeper waters are not quantifiable because of unique currents and upwelling effects (Bowman, 24). But in general, exchange between the atmosphere and shallow ocean takes 6 to 10 years and exchange between the shallow ocean and deep ocean can take hundreds of years, possibly 1,000 years (Taylor, 8 &38). Evidence of the marine effect is obvious when one tries to date sea life. In one example, shells dated in two different locations (but in close proximity) dated centuries apart (Bowman, 25). Marine animals like whales and seals show radiocarbon ages of hundreds of years (Bowman, 25). Bottom feeding fish often exhibit old age because of reservoir effects (Taylor, 131). Even shallow marine life can be affected by the reservoir effect. The Colorado River (before it was drained) would carry large amounts of carbon, from the limestone rock it flowed over, into the Sea of Cortez. This diluted the C12/C14 ratio in the Sea of Cortez , giving marine life a carbon age of 900 years (Taylor, 129). The only way to accurately date sea life is if the reservoir effects and the value of stable carbon isotopes are known (Taylor, 52). Since the ocean mixes much slower and reservoir values vary from region to region, the reservoir effects alone prevent accurate dating, much less the numerous sources of stable carbon in the ocean that alters C12/C14 ratios. Scientists have proposed average correction factors (reservoir age estimates) to introduce to dating marine life, but these factors are far from absolute due to the nature of slow upwelling mixing which can vary from wind, climate, coastline shape, near-shore currents and seafloor topography (Taylor, 129). These variables make it impossible to establish standard global correction since they all differ in magnitude and are subject to change, especially if we’re looking back thousands of years. Hemisphere Effect: While atmospheric mixing is good within hemispheres, it is not good between them since winds rarely blow between the two. This is further compounded by the southern hemisphere having more ocean surface, and thus, there is more “interface” between ocean and atmosphere (Bowman, 25). This translate into a difference in C12/C14 between our two hemispheres. Volcano Effect: When volcanoes erupt they release large quantities of CO2 that contain no C14. This dilutes the ratio of C12 to C14 in the atmosphere (Bowman, 26). Plants near volcanoes typically exhibit high ages because of this. Vegetation found on the volcanic island of Santorini often carbon date in excess of thousands of years (Bowman, 27). Carbon dating volcanic debris is wrought with controversy because of this. However, the negative effects volcanic eruptions have on carbon dating isn’t isolated to volcanic debris, but extends to the entire atmosphere it released its CO2 into. In summary, because of varying C14 production rates, plant life ingesting a ratio of C12/C14 different from that of the atmosphere, reservoir effects, the hemisphere effect, and the volcano effect it is painfully clear that the original assumption, that the C12/C14 ratio in the atmosphere is equally distributed in the biosphere, is far from accurate. Assumption 3 Carbon ratios are only altered by C14 decay after an organism dies. 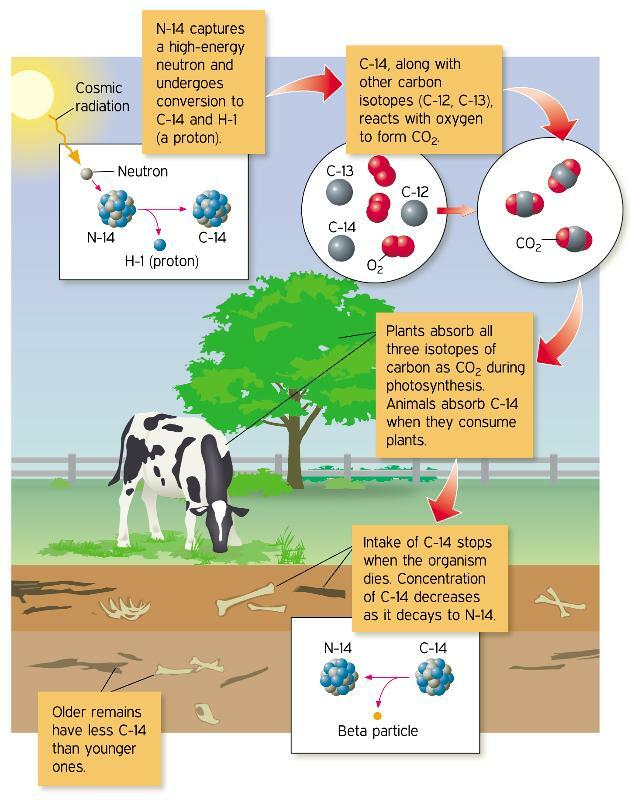 In order for radiocarbon dating to accurately gauge the amount of time that has passed since the organism died, the radio decay of C14 must be the only factor influencing the ratio of C12 to C14 within the organism. Any other factor influencing the ratio other than C14 decay is contamination. Bowman writes, “Any addition of a carbon contaminating material is contamination, and it must be removed before the dating process begins, otherwise a false result can be obtained” (Bowman, 27). This problem of contamination is quite a thorn in the side of radio carbon dating because it is very common. Hard Water Effect: Hard water often has calcium ions in it from calcium carbonate. This adds additional carbon into the plant or animal that takes it in. Since hard water varies from region to region, especially over large time scales, it is an unquantifiable variable. Other similar unquantifiable variables that contain carbon are soil humus materials and carbon dioxide in soil. Bowman writes, “The hard-water effect is not quantifiable since it is dependent on local factors…” (Bowman, 26). Unfortunately, many incredibly valuable finds, like bones, are easily susceptible to hard water contamination. Bones are prone to absorb waters in the ground due to their porous nature (Taylor, 54). If the water is rich in carbonates, as ground water often is, the bone becomes contaminated with carbon ratios that make the bones appear much older than they actually are. Taylor writes, “It is clear that it is difficult to generalize concerning the age relationships of the organic and inorganic fraction in bone without detailed geochemical information concerning the depositional environment,” (Taylor, 55). This problem, however, is no longer so devastating to dating bones since the AMS can date portions of the bone that are non-porous, such as an individual amino acid, to avoid the contamination factor (Warf, 216). Pretreatment: Samples for dating are often “pretreated” to remove any carbon contaminants. This is usually done with acids. But not all contaminants can be removed, neither can they, at times, be identified for that matter (Bowman, 27-28). Often pretreatment can’t be used because it would destroy the object trying to be dated. Some objects are so intermingled with their surroundings they can’t be accurately dated. For example, a human body was found in a peat-bog in Cheshire England. The carbon rich bog was united with the carbon rich body. This mixing of carbon proved to be problematic. Two forms of carbon dating were used; conventional gas counting and AMS. AMS dated the man’s death to the first century. The conventional dating placed the man to the fourth and fifth centuries (Bowman 52). Another source of contamination comes from microorganisms. Microorganisms can contaminate samples causing 1,000 to 2,000 year discrepancies. The longer a sample is exposed to microorganisms the greater the chance of contamination, and subsequently, greater the age discrepancy (Taylor, 51). The farther one goes back in time, the more severe contamination becomes. Because of the exponential nature of carbon decay, objects older than 30,000 years can have massive discrepancies if there is even 1% contamination of modern carbon (Taylor, 116). For example, objects 50,000 years old will carbon date at 35,000 years old with a 1% contamination. Even objects less than 30,000 years old can be greatly affected by modern carbon contamination. An object 10,000 years old will appear 1,000 years younger with a 5% modern carbon contamination. Introducing 1% of “dead carbon” to a sample will increase it sage by 80 years. Introducing 10% “dead carbon” increases its age by 850 years (Taylor, 119). Though contamination can be pretreated, and the AMS is so precise it can avoid many contaminants, many other contaminants can slip by unknown if not detected. Some contaminants are so embedded in the sample that they cannot be removed without destroying the sample. Thus, there are many ways to detect and avoid contamination, but it would be fallacious to say that there is any 100% certainty that all contaminants have been removed from any given sample. The assumption cannot be validated with full certainty. Assumption 4 The half-life of C14 is accurately known. The decay of carbon is not a prediction, but statistical probability estimation. Taylor writes, “It is assumed that if the decay events are truly random, if no other factors intervene, and one had the time to measure an infinite number of events, the counting data would be identical to a normal distribution,” (Taylor, 103). C14 decays randomly. There is no way of knowing exactly when a C14 nucleus will decay and release a beta particle. Instead, large numbers of C14 atoms are measured over periodic intervals, and overtime there is a normal distribution (Taylor, 103). However, because the decay rate of C14 is a statistical estimate, this makes laboratory error estimation difficult as you will read about in the next assumption. As far as this assumption, we can conclude the half-life is known, and thus the assumption validated, but the nature of the estimation limits error estimation which comes into play in the next assumption. Assumption 5 C14 can be measured accurately. The first thing to address here is the misconception that radiocarbon dating provides exact points in time for objects of antiquity. As Taylor explains, “… by definition, a C14 ‘date’ does not indicate a specific point in time. It expresses the time interval within which there is a given probability that the C14 age equivalent of the actual C14 activity of a sample actually lies,” (Taylor, 125). Because of this, there are two ways to gauge the validity of a radiocarbon dates; precision & accuracy. Accuracy is the ability to date an object accurate to archaeological dates. Precision is the range of dates determined (Taylor, 106). For example, an object might be dated to 1,300 B.C. plus or minus 200 years and thus be high in accuracy but low in precision. Or that object might miss the mark completely and be dated at 2,000 B.C. plus or minus 10 years, in which case it wasn’t accurate but had high precision. Due to the amount of variables involved in carbon dating, results can have varying accuracy and precision. Since radiocarbon dating is a scientific process it is subject to experimental error. And as mentioned in the previous assumption, that the decay of C14 is a statistical probability estimation, it becomes very problematic to derive any concrete error estimations. Bowman writes, “Experimental error, inherent in any operational process, is usually evaluated by replication of the measurement process. In radiocarbon dating, time, cost, and (for conventional radiocarbon) sample size mean this is not a practical proposition. The error term is therefore estimated and then usually treated as if it were known” (Bowman, 38). Another issue in the process of radiocarbon dating is the range of date estimates. Since not every test will give the same result, not every object will give the same result, and the error factor is a mere estimation, the only way to truly generate accurate results is to date multiple samples multiple times to provide a range of results. Taylor writes, “The accuracy of an individual C14 determination is directly related to the degree to which the assumptions of the C14 method are fulfilled for the carbon-containing materials in a given sample. Unfortunately, it is often difficult to evaluate directly the various factors that could influence the accuracy of a single C14 value. For this reason, little reliance [is] placed on an individual C14 ‘date’ to provide an estimate for a given object, structure, feature, or stratigraphic unit… actual age can be best made with a suite of C14 determinations on multiple samples… Unfortunately, until recently, multiple C14 analyses on different fractions of single samples have not been routinely employed due to limitations on sample size and costs,” (Taylor, 105). Even the machines themselves are not 100% reliable. The conventional radiocarbon methods have been historically fraught with inconsistencies and can be contaminated by other sources of radiation. Conventional carbon dating also depends on a background count rate, which varies from laboratory to laboratory (Bowman, 37). But these issues are not just limited to the older conventional methods, AMS has issues as well. Often, labs will try to calibrate their AMS with “procedural blanks” or “dead carbon” materials to test for carbon contamination of their equipment. Such materials are Precambrian since nothing that old should have detectable C14. Yet, these materials have continually been known to give off detectable C14 readings (Snelling, 860). So knowing that radiocarbon dating requires multiple tests on multiple samples in order to ensure accuracy and precision, something not commonly done, in combination with the fact that experimental error is not known, but only estimated, it is reasonable to say that this assumption cannot be validated beyond reasonable doubt. It thus remains an assumption open to inquiry. Assumption 6 C14 decay rates and formation rates are in equilibrium. This assumption, unlike the others, is very straight forward. C14 formation and decay must be in constant equilibrium for radiocarbon dating. As we’ve already discussed, production rates in the atmosphere are variables. Currently, the rate at which C14 decays is not in equilibrium with the formation rate. This ratio may swing in either direction depending on variables in C14 production. Either way, this assumption is false. Outside of the assumptions, there are other issues that come into play within the radiocarbon dating process. Old Wood Problem: As a tree grows and adds rings the outer rings continue to exchange carbon whereas the older internal rings do not. Thus, if one were to date the heartwood vs. the outer sapwood there will be a discrepancy. This is even greater if the tree aged to hundreds of thousands of years (Bowman, 15). This poses a problem for modern artifacts because the only way to accurately date the wood is to know how old the tree was and whether the wood was from the inner heartwood or outer sap wood (Bowman, 16). The only way to date wood with radiocarbon is if the sapwood and heartwood are identifiable. After which, the rings can be dated backwards from the sapwood to the heartwood to calculate the age of the tree. Bowman writes, “Quite often this ‘old-wood’ problem is inadequately considered by those who submit radiocarbon samples” (Bowman, 51). Object vs. Alteration: This is also known as the Delayed Use problem. An item is used after it “dies,” thus the item can be dated, but not its usage. For example, a carved elephant tusk can be carbon dated to show when the elephant lived but not when the tusk was actually carved. Re-Use: Items that are generally long lasting, like wood, may be used multiple times. For example, a tree is cut down, its wood is shaped to build a structure, then 100 years later it is scrapped and used for kindling. The wood can be dated, but the intervals of use and re-use are not necessarily datable. Another popular misconception is that radiocarbon dating is always right. I hope, by now, you’ve realized this isn’t the case. But often the success stories of radiocarbon dating are paraded around in magazines, journals and textbooks while the failures of radiocarbon are conveniently never noted. Additionally, the known dates that carbon dating has accurately verified tend to be recent dates. Whereas, radiocarbon dates prior to 400 BC increasingly “diverge,” (Snelling, 856). Here are just a handful of known situations where radiocarbon dated incorrectly. -In the 1950’s discrepancies were found between known dates and radiocarbon dates to magnitudes of 600 to 800 years (Taylor, 19). -Snails living in artesian springs can produce carbon ages of up to 27,000 years (Snelling 857). -An Egyptian coffin known to be 2,280 years old, carbon dated to 2,190 years old (Warf, 213). Many Egyptian artifacts carbon dated have had discrepancies as well. Something which Bowman states were, “far from insignificant…” (Bowman, 16). -Archaeological items from 400 BC were providing results 900 years too young. Items from 1,000AD provided results 100 years too old (Bowman, 17). -A stratified medieval village that existed from 600 to 1200 AD was excavated, its remains carbon dated. 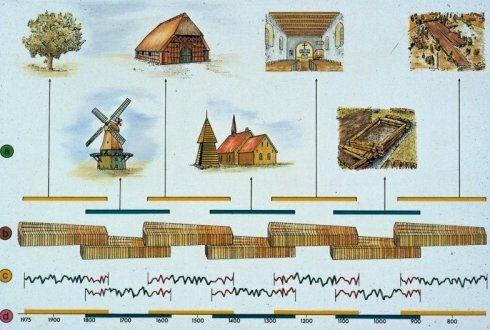 There were a total of 5 stratified layers within the 600 year span of the village. Yet the artifacts dated provided 300 to 500 year age ranges in each layer. This can’t be so if the village only existed from 600 to 1200 AD. In fact, one artifact from the latest layer (1200AD) dated at 600 AD, and another artifact from 800 AD layer dated to 400 AD (Taylor, 112). -Snail shells found in a French Archaeology site yielded radiocarbon dates 300 to 1300 years in excess (Taylor, 52). -During the 17th century C14 variations throw off radiocarbon ages (Taylor, 35). Another shocking factor is that items that are most difficult to date accurately are in fact items most likely to be dated with radiocarbon. 80 to 90% of all C14 age estimates are based on wood/charcoal and marine shells, because they are best preserved, and thus are more commonly found (Taylor, 61). Yet the Marine Effect and Old Wood Problem often corrupt the accuracy of radiocarbon dating, and these problems are directly related to the dating of marine shells and wood/charcoal. As discouraging as they may be, there is, however, a more discouraging factor to consider: Radiocarbon often conflicts with established geological dates. -Materials found in earth deposits often don’t date in agreement with the pre-determined dates of the deposits. For example, domesticated wheat and barley where found in deposits in Egypt that were supposedly 17,000 to 18,000 years old, yet the wheat and barley date to no more than 5,000 years old (Taylor, 110-111). -In another example, fragments of maize were found in 2,000 year old sediment deposits in Illinois, but the maize carbon dated to no more than 1,500 years old in one site, and no more than 600 years old at three other sites nearby (Taylor, 111). -A limestone rock layer considered hundreds of millions of years old via geologic estimates, carbon dated with an age of 1,600 years (Taylor, 34). -Radiocarbon has been found in fossilized wood within Tertiary, Mesozoic and upper Paleozoic strata that themselves are dated from 32 to 250 million years old. The wood dated between 20,000 to 45,000 years of carbon (Snelling, 859). -Coal beds wedged between rock strata dated 300 million years old have been carbon dated to 50,000 years old (Snelling, 847). -Dating diamonds is significant because there is little chance of contamination. Yet diamonds that are supposedly one to three billion years old have yielded carbon 14 readings. Coal and diamond samples from the US to Africa, believed to be 40 to 350 million years old, have yielded consistent carbon dates of 50,000 years old (Snelling, 861). It may seem odd that radiocarbon dating would be in conflict with the conventional geological ages, but these ages were established long before radioisotope dating technology was invented. As Snelling affirms, “By the time the radioisotope ‘dating’ methods had been developed, the geological timescale had already been imposed on the globally-correlated rock sequence,” (Snelling, 838). This leaves us with a conundrum. If we hold radiocarbon dating to be accurate, we then exclude the conventional dating of geological features. And vice versa. However, the stronger argument is that the conventional geological dates are incorrect because anything millions of years old should have no trace of carbon left that would be picked up by the AMS. For example, if a beginning mass of C14 the size of earth began to decay with a half-life of 5,730 years, over the course of 1 million years (175 half-lives) there wouldn’t be one single carbon 14 atom left (Snelling, 859). So this presents a rather large problem for the dates assigned to geological formations. These errors overall, however, only account of “known” discrepancies. The vast amount of radiocarbon dating being applied to prehistoric objects, of which there is sometimes no way of confirming their accuracy, cannot be proven wrong. So they remain success stories, innocent until proven guilty. However, based off the numerous known false instances given here, it would be appropriate to understand the radiocarbon dating method as anything but precise and accurate beyond reasonable doubt. Many of the problems facing the radiocarbon dating of objects can be identified, pretreated, and calibrated for. But there are more significant issues that cannot be quantified and thus cannot be addressed to ensure accurate results. The first two assumptions, production and biosphere equilibrium, remain the most significant problem radiocarbon faces. Many scholars and scientists have recognized the limitations of radiocarbon dating. Bowman writes, “Rarely is the interpretation of radiocarbon results completely straightforward. Occasionally a sample is dated simply to determine roughly whether an object is modern or of considerable antiquity; in essence, an authenticity test” (Bowman, 57). Another shortcoming of the practice of radiocarbon dating is lack of data in regards to invalid ages. Submitters of Radiocarbon Journal often list their successful radiocarbon results as “archaeologically acceptable.” However, they do not list their “archaeological unacceptable,” results (Bowman, 62). Many are disappointed at this because it does not allow open divulgence of data for investigating the errors in order to produce more accurate and precise future dating. Additionally, lack of data of failed radiocarbon prevents an overall assessment on just how accurate the dating method is. When you get down to the bottom line, it is more than evident that radiocarbon dating is extremely limited. Only very particular objects, from very particular places, that have been pretreated, that have been compared to a calibration curve (and only fall within areas of the curve that aren’t flat), and have been dated many times to provide an error range, can be considered somewhat trustworthy findings. That is, if you overlook the shortcomings of the C14 production problem and biosphere equilibrium problem. Accordingly, these evident shortcomings need to be appreciated and a certain degree of skepticism should be maintained when reading of radiocarbon results. All too often one hears of a discovery from antiquity that has been radiocarbon dated, of which the authors conclude they now know the exact date of the finding. Yet such confidence is often unwarranted. Yes, radiocarbon is an ingenious method and noble pursuit to answer questions about our past, but it is far from perfect, and our strong desire to have absolute answers to our biggest questions will not be satisfied from overextending confidence into a constrained method simply because there is no other alternative. But until we can lay our egos aside to be comfortable with the humbling notion that “we don’t know exactly,” radiocarbon dating will remain the absolute say on exactly how old something is. A common remark I get when I talk to people about the Bible is related to the intelligence of the authors. It usually goes something like this, “Why would I believe something written by stupid desert people?” And they usually talk about the earth being flat, belief in Gods, and other things that obviously only stupid people would account for. It seems logical at first. After all, who wants to read a book about the most important subject of all time, if the authors were imbeciles? How do we know they were stupid? This is the first question we have to ask ourselves. How do we know they were stupid? Because they believed the earth was flat? That is actually a widely over used misconception. Nothing in the Bible says anything about the earth being flat. In fact, the Bible actually indicates the earth is a “circle” and “sphere,” (Job 26:10 & Isaiah 40:21-22). For more info on where the flat earth theory comes from I recommend reading another article I posted, https://matthew2262.wordpress.com/2011/03/15/anti-religion-funny-comics-and-demotivational-posters/. The ancient people of the Bible did not believe the earth was flat. One reason we think that the ancient people were stupid is based on a presupposition of evolution which maintains that humans are constantly evolving and improving. If we therefore go backwards in time we’ll stumble across less and less developed humans which are less and less mentally superior. But is this really the case? Instead of speculating on what we think we know, let us look at the actual facts. Just how dumb were the authors of the Bible? Well, not dumb at all actually. In fact, many of the authors were in fact very bright for the time and age they lived in. Moses was raised in the finest schools for Egyptian royalty. David was educated byBabylon’s highest ranking educators. Luke was a physician. Solomon, the author of Proverbs was given the Wisdom of God. Paul was highly educated as well. In general, people were not “stupid” in the ancient world but incredibly inventive and clever, developing all the tools, languages and mathematics that our modern society and sciences rest upon. The Egyptian pyramids to this day baffle engineers and historians as to how such an ancient society could develop such a complex and massive building feat. Ancients knew how to create steel and combine metals to create alloys. They developed critical systems like the ramp, screw, pully, lever, ect. They could navigate using the stars, and plan remarkably precise building projects using the stars. They knew how to irrigate and farm. They knew how to artificially select livestock for stronger off spring. These are not achievements of “stupid” people. This is not to say that were not any less intelligent people in ancient times. Every population has a variety of people with intellectual capability. But this same variety exists to this day. From a theological view point, the Biblical authors were inspired by the divine wisdom of God anyways. In such a case it wouldn’t matter to the IQ of the author, if he is being inspired by the all superior intelligence of God. We falsely assume we’re more intelligent because we can fly in airplanes, look up anything online, go to the moon, send robots to Mars, cure deadly disease that once wiped out thousands of people, ect. But ask yourself this; could we have achieved these things without the basic foundations laid down by our more “primitive”predecessors? You can’t design a jet engine if the basic chemistry for refining fuel had not been developed. You can’t travel through space if the fundamental laws of physics had not been known. What good is a car without the wheel? It is easy to boast about how intelligent you are when you are standing on the shoulders of the men and women of the past who did all the grunt work to discover the knowledge you so assertively take credit for. Here is another question. Does access to more information really make you more intelligent? We can today access just about anything online. A real manifestation of education of the masses! But are there costs to today’s technology? There are sadly many. Most profoundly of which is memory. With information so accessible and devices like lab tops, phones, and even a pen and paper, our memories are seldom utilized. Ask yourself how many phone numbers of friends and family you know off the top of your head without resorting to your phone or a phone book. However, in the ancient world where such technology was not available, even writing utensils a rarity, people required strong memorization skills to retain information to pass down to later generations. Such memorization skills are demonstrated in the ancient use of oral tradition, which has been proven to be incredibly accurate. So accurate that it has been suggested that any average ancient lay person could easily memorize and retain MORE information than the average person today. Unfortunately such a scenario is only hypothetical. The problem is that we think that because we know more today than people in the past, we are therefore smart and they stupid. But let’s put this into perspective: We today consider ourselves smart. Now hypothetically two hundred years from now humans will obviously know a great deal more of information than we do today. They’ll know so much in fact that surely they will overturn many of the theories and facts we hold to be true today. They will know so much that they will look back at people in the early 21st century and consider us… stupid. But wait… I thought we were smart? I thought that we today are advanced and intelligent? You see, by comparing the wealth of information available today to the lesser amount of information in the past you are in essence creating an illogical standard by which to gauge intelligence. If such is the case then we are stupid because there is so much more we don’t know in today’s world that will be discovered in the future. Clearly there is a flaw is such reasoning because one could argue both ways that we are stupid or smart. The only way to properly rationalize the intelligence of people in my opinion is within the context of the age they live in. And thus, considering that many of the Bible’s authors were highly educated during the periods in which they existed, one cannot claim that the Bible was written by stupid desert people. …many of them didn’t even live in the desert anyways.